I’m Bryant Meyers, author of the book “PEMF – the 5th Element of Health.” I want to give you 17 really good reasons why I like the iMRS PEMF device (and previously the MRS 2000) over all the other devices that I’ve tried. Actually, I’ve used and tried out about a dozen different PEMF devices, and owned six myself personally. At the time it was the MRS 2000 that worked best for me out of all the devices. I noticed better sleep the very first night. This was a time in which I had insomnia. I also felt more energy the next day, and it was very tangible. I could really feel the results. So, here are 17 reasons why the iMRS is the best PEMF device available today. 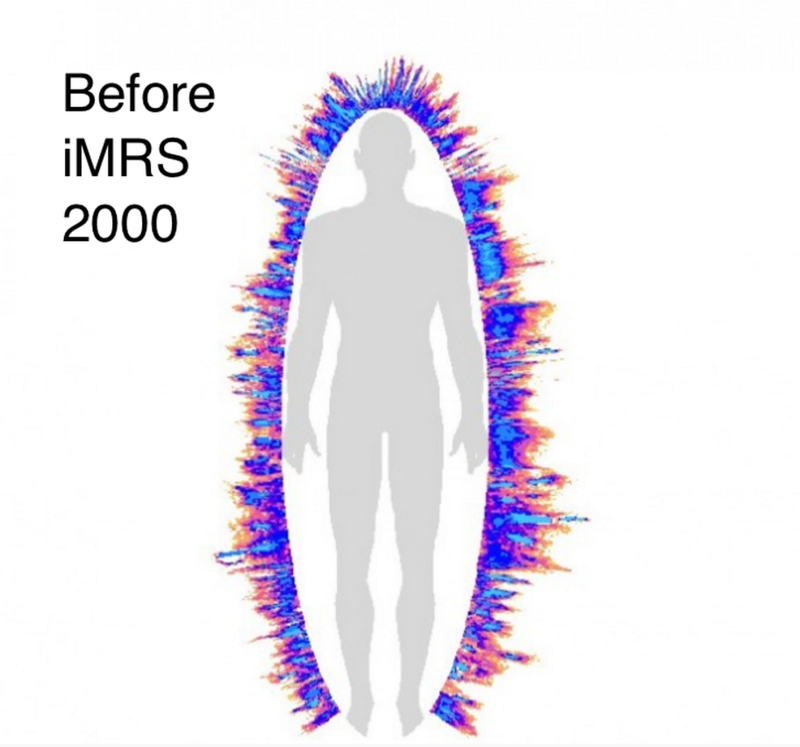 The iMRS is the only stationary PEMF system in the world developed and designed based on fundamental PEMF research featuring all known earth-based and atmospheric frequencies incl. 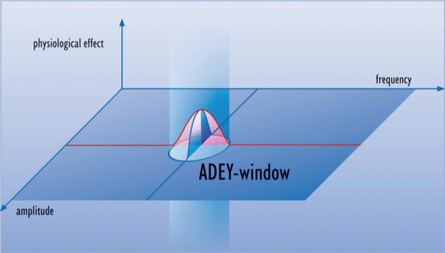 the resonating frequencies researched by Adey & Bawin (Biological Window)! 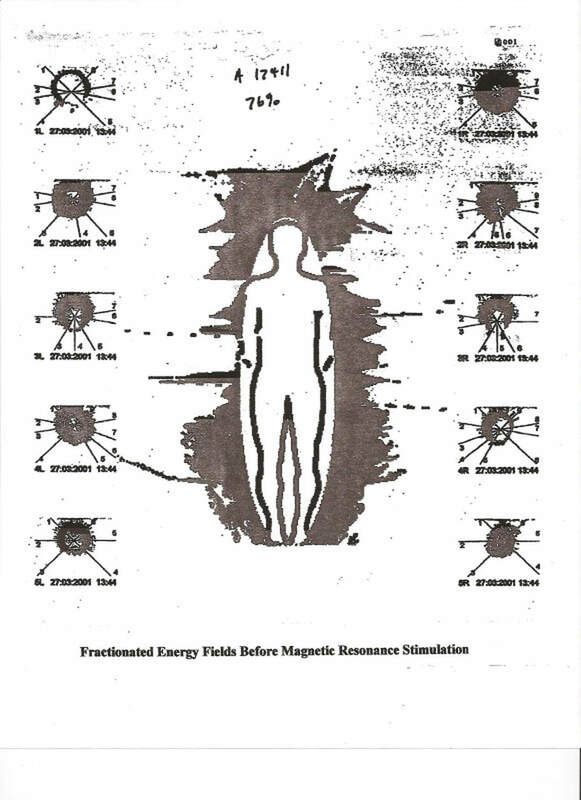 The iMRS is one of the few full-body mat PEMF device that I’ve found that primarily uses the frequencies of the Earth. 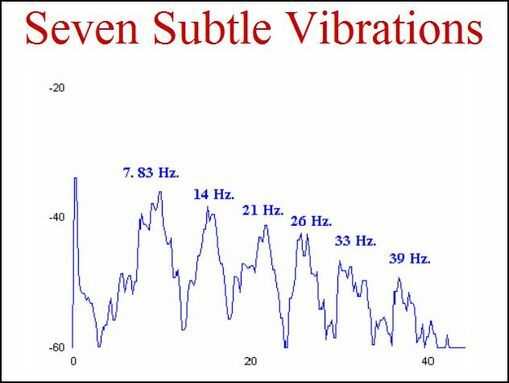 As I discuss in my book and other videos, these 0-30 Hz frequencies are the frequencies that the Schumann resonance in the Earth, and the higher harmonics of Schumann, are the frequencies that our tissues and cells respond to. And these are actually the frequencies that we project, according to Zimmerman and Sato’s studies in Japan. And also it’s very common knowledge that our brain state from low Delta to high Beta goes from 0-30 Hz. That’s just standard, medical knowledge. So the #1 reason is that the iMRS uses exclusively Earth-based frequencies. Does the iMRS 2000 cover 0-30 Hz (and beyond) even though the listed frequencies are .5 (night), 3 (evening), 5.5 (noon) and 15Hz (morning). 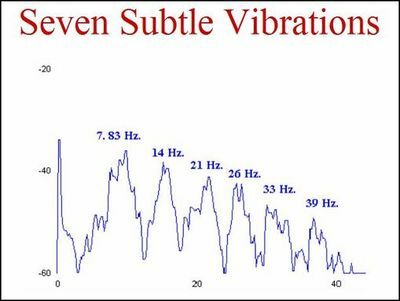 Chart shown demonstrates that this frequency range is not only the most natural, but has the most research to back it up. But YES! The iMRS 2000 covers this range very nicely. The iMRS 2000 does go higher frequencies due to the harmonics of the pure tightly wound copper coils and the nature of electromagnetic waves (and anything that gives a pure vibration (tuning forks , etc.). Plus the sawtooth waveform has many more bundles of frequencies embedded within the signal itself. 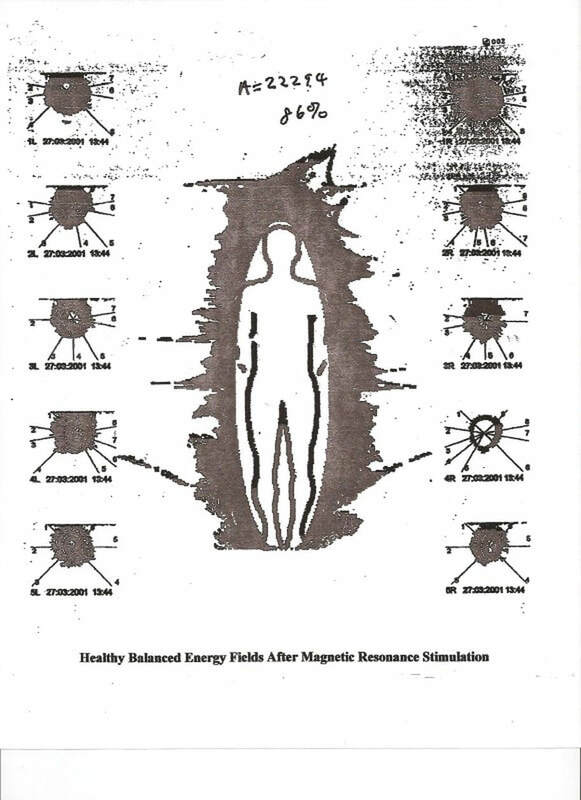 Carrier Frequencies in full body mat are .5, 3, 5.5 and 15Hz. A fundamental principle of physics is that each frequency transmitted has higher harmonics (as do musical instruments and tuning forks). So with these harmonics the iMRS 2000 covers 0-50 Hz and then some up to the MHz even (as coherent higher harmonics of earth frequencies). And because of the nice sawtooth on full body mat and the tightly wound pure copper coils, you get a wide range of harmonics easily covering 0-50 Hz which is the most important range. Sawtooth spectrum contains both even and odd harmonics of the fundamental frequency. Theoretically it contains of all even and uneven harmonics with no limit in band width it goes definitely up to the MHZ range (Thats why we are using this sophisticated wave form as we increase the power of probability of resonance). The amount of harmonics is huge! What this means is ALL the frequencies are covered in Every session. This makes it much easier AND more effective than systems where you can or need to program in specific frequencies (which is VERY limiting). 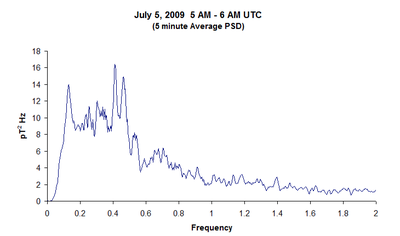 Schumann on Right, Geomagnetic On Left. The iMRS 2000 has a built-in biorhythm clock using the frequencies listed in the last section of .5, 3, 5.5 and 15 Hz. This is great because it gives you the right frequency for the time of day. Reason #3 - Perfect Intensity (and low setting for sensitive). The iMRS uses safe yet strong-enough intensities. The iMRS has an ideal range from the nano-Tesla, for the people who are really sensitive, up to even 300 micro-Tesla on the new probe. So it’s great for both sensitive people, and for localized pain relief that needs a little higher intensity. These intensities are always in the range deemed safe by different governing agencies, like the DIN and other worldwide organizations that set safety levels for intensity. So, you’ve got a good, strong-enough intensity that’s still safe. I also like that it’s a graduated intensity, so you’re getting a higher intensity toward the feet and a lower intensity toward the head. The head and neck are more sensitive. But even better recommendations (because frequency is also taken into effect) are given by the INTERNATIONAL COMMISSION ON NON‐IONIZING RADIATION PROTECTION (ICNIRP). The ICNIRP is a world-wide authority on safety related to elec- tromagnetic energy. The EU and FDA both rely on their findings. 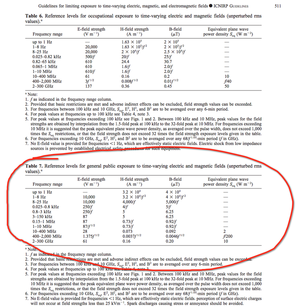 According to the ICNIRP, the limiting values for safety of time varying PEMF are dependent on both the frequency (usually measureed in Hz) and the flux density (or Intensity - measured in microtesla). But if frequency above 25 Hz, than anything over 5uT is problematic (that’s weaker than earth’s magnetic field). The higher the applied frequency the lower the limit value for intensity that is safe. This means, if you apply a very low frequency (like the earth fre- quency range 1-25 Hz) you are allowed to apply higher intensities. See link below. Again the key is frequency resonance, not intensity, so it's best to avoid these machines unless under direct supervisor of a healthcare professional trained in using these devices. Demonstration the iMRS has PLENTY of intensity to go through the body and a couple feet above! The iMRS uses research-proven waveforms; the saw tooth and the square wave. The iMRS PEMF system uses the proven saw tooth waveform which provides the cells with a full-frequency spectrum simultaneously that will resonate with different tissues. As Siskin & Walker showed different tissues in the body respond to different frequencies, primarily within the 0-30 Hz range. When you use a saw tooth and the harmonics of a saw tooth you are getting a broader frequency spectrum. It’s also a rapid rise and fall, which relates to the new waveform which is the square wave. The square wave was the particular waveform that NASA found to be the most effective for healing and regeneration. They found specifically that low intensity, low frequency (around 10 Hz) and a rapid rise and fall (which both the saw tooth and square wave have) was the most ideal signal for healing and regeneration. In fact, they found that lower intensity worked better than higher intensity, and the lower frequencies worked better than the higher frequencies. And the rapid rise and fall saw tooth and square wave worked better than a sine wave or the more simplistic waveforms that don’t have a rapid rise and fall. When it comes to research studies, it does not get any better than NASA. Of more than 10,000 research papers and 2000 plus double blind studies on PEMF therapy; none was more thorough and conclusive as the 4 year NASA study lead by Dr. Thomas Goodwin, PhD, on the ability of PEMF to improve the growth and repair of tissues in mammals. 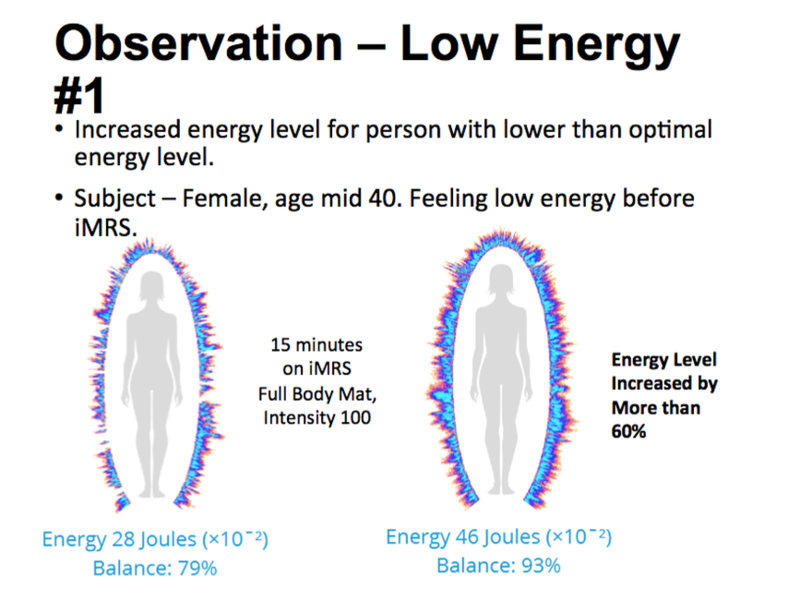 Without getting into technical details of the study, I will summarize and share the main benefits of PEMF therapy that the NASA study conclusively demonstrated as well as the exact type of energy, frequency, intensity and waveform used. Low Intensity: ~10-200 milligauss (1 - 20 microtesla) which is even less than the strength of the earth’s magnetic field (33 - 66 microtesla). Additionally NASA found that slowly varying (millisecond pulse, sine wave), non-varying (static magnetic) had little or no effect. Only one or two of the waveforms had biological effects in the NASA study. Square or Trapezoidal wave .. There was very significant changes in Gene expression. Normal human neural progenitor and HNP cells in culture. Scientific results were robust. NASA did two sets of experiments. The iMRS is the only stationary PEMF system in the world with an implemented solid copper coil design allowing defined and increasing intensity levels from the top to the bottom of the whole body applicator. This feature enables to perform gentle applications and mimics the natural absorption of the earth magnetic field for human beings. The iMRS uses tightly-wound pure copper coils. The iMRS has three pairs of tightlywound coils and this gives you a pure magnetic field. Some of the competitors use basically plastic tubing with copper inside, but they wind it in a way that’s more of a oval and the spacing in between isn’t very tight, so the field lines bleed off and you’re not getting a pure magnetic field. The purest magnetic field is very tightly-wound, circular coils. The iMRS uses a full-body mat. 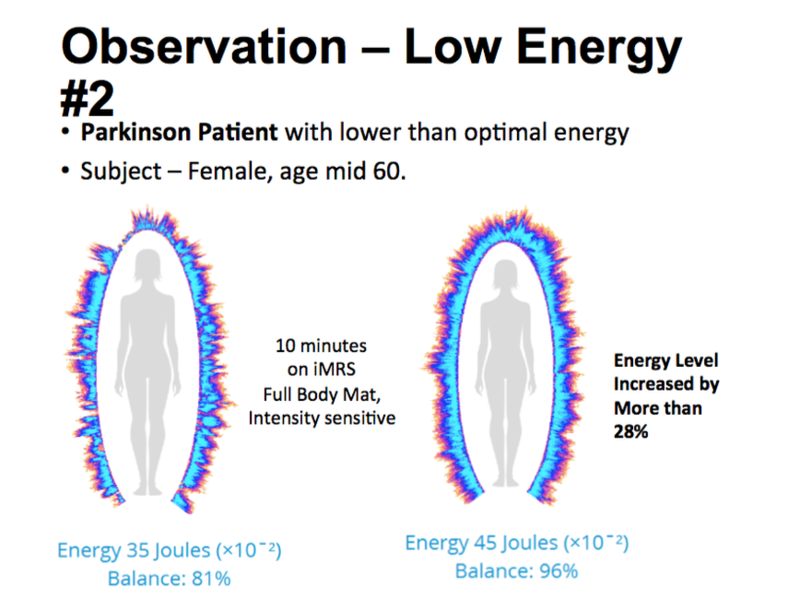 You definitely want to get a full-body mat PEMF device to tap into the amazing benefits. When Dr. Oz promoted PEMF therapy on TV as one of the greatest breakthroughs for pain relief he was very specific on recommending a full-body mat device. I do agree with that because you want to energize the whole body first, before you go onto to local application with the applicators. 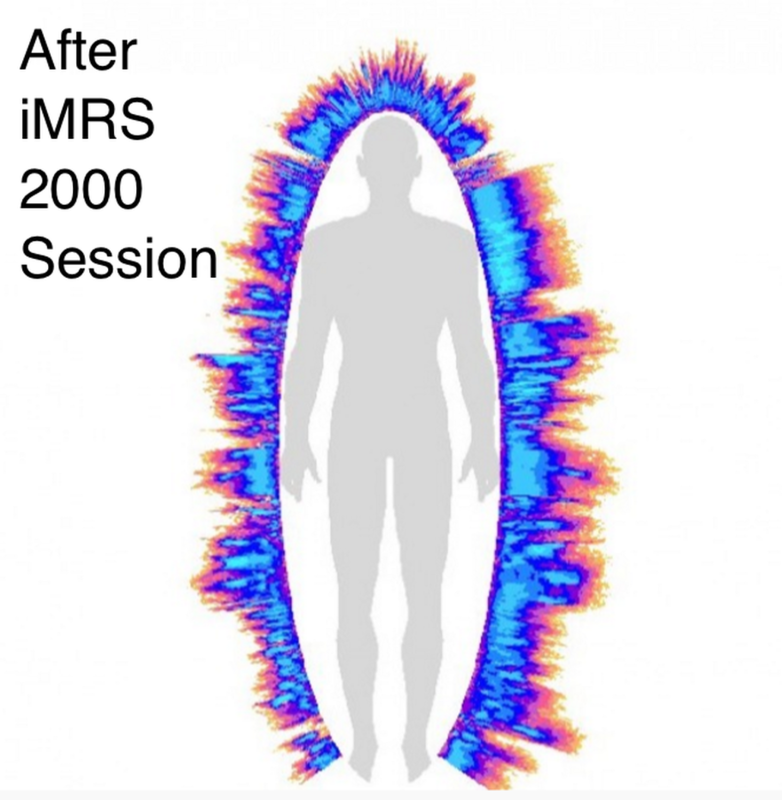 ​The iMRS is the only stationary PEMF system in the world which features both, scientifically documented and proven wave forms, Sawtooth and Squarewave! ​​The iMRS 2000 Probe has over 100 turns in the copper coils with a ferrous core that maximizes magnetic field flux, strength and penetration depth. Night and Day difference to the B.Spot. The iMRS 2000 Probe for local application is SO much better, stronger and more effective for local pain relief, healing and regeneration than the Bemer’s Local applicators. Many of our pain relief and healing stories come from this very powerful probe applicator. The iMRS is digital, programmable, and easy to upgrade. There’s a lot of programmability and intelligence built in to the new iMRS. It’s definitely an upgrade from the previous MRS 2000. The iMRS is the only stationary PEMF system in the world with an optional implementation of dynamic biofeedback control. The iMORE system contains of a photoplethysmographic sensor and specific software evaluating the heart rate variability (HRV) of the user and automatically adjusts intensity levels during an application if necessary! The iMRS has a HRV advanced biofeedback system, called the iMORE. The iMRS is the only PEMF system available in the U.S. with advanced biofeedback. This puts the iMRS on “auto-pilot” because it automatically adjusts the intensity of the unit based on a heart rate variability biofeedback. It also gives you a unique session every time you use it, further preventing habituation or acclimation to the unit. That definitely happens with the sine wave and simple magnetic mattress products. You just don’t get the same benefit over time that you would initially. One of the easiest and most effective forms of biofeedback is Heart Rate Variability (HRV), which can be easily and accurately measured through the pulse (finger or ear sensors). The iMRS is the worlds only stationary PEMF system, which simultaneously allows pulsed magnetic field application AND brainwave entrainment! 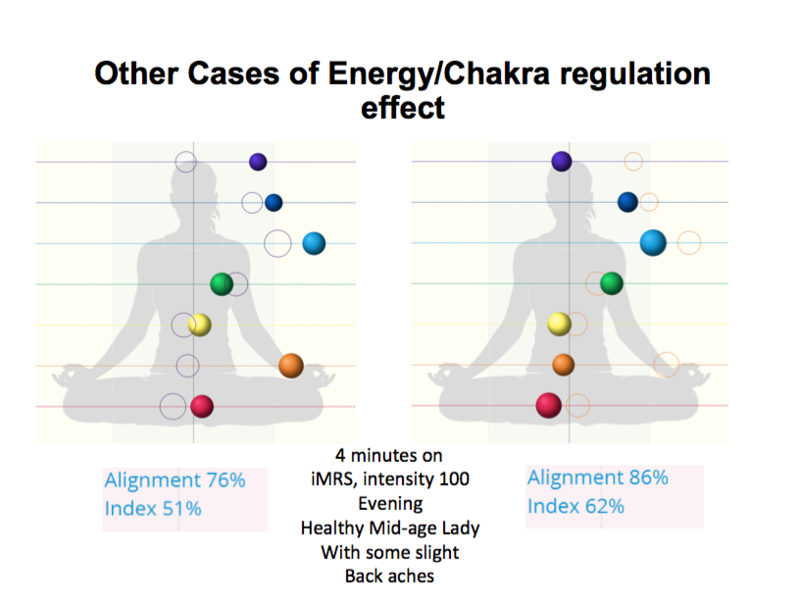 The iSLRS System expands the iMRS to the possibility of using specific light, color and sound frequencies to stimulate the brain to increase and optimize the holistic wellness effect during each application. The iMRS has an integrated light and sound system that helps to further bring the mind to deeper relaxation. It’s like a spa for the mind – it’s a nice addition. The frequencies in the light and sound system are synchronized to the frequencies of the mat, so it’s a nice synergy. 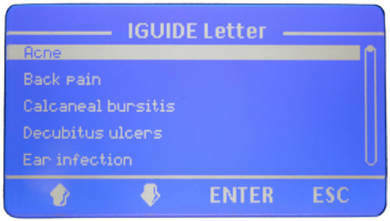 The iMRS is the only stationary PEMF system in the world with an integrated and pre-programmed database (iGUIDE) allowing the user to customize an application based on the actual condition! 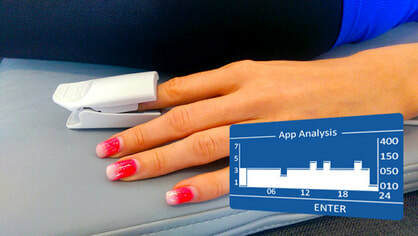 The iMRS 2000 has an iGuide for practitioners with a Built in Database of 284 health conditions and pre-programmed settings for the full body mat, pillow and probe and all the 4 biorhythm settings (which automatically come up based on time of day). This adds up to OVER 3400 total protocols. These protocols are based on over 10 years of clinical data and once your purchase we can send you an ebook to substantiate all these protocols. This helps practitioners (and customers) to get the exact settings they need for most common health conditions. So all the research proven protocols are at the tip of your finger. The Bemer only Has set protocols for EVERYONE!!! See Chart below. This is a HUGE advantage to the iMRS which with both the iMORE biofeedback AND the iGUIDE database of protocols gives you EXACTLY what you need. Bemer only has cookie-cutter protocols that are supposed to work for everyone from elders to pro athletes. It’s basically guesswork if you go outside these rigid recommendations. The iMRS reverses polarity every two minutes. This is important because your body will acclimate or become adjusted to a signal. What this means is that the benefits you get with the iMRS 2000 will not decrease or wane over time. 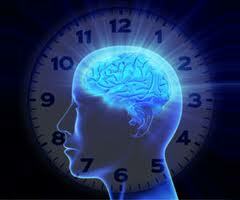 There is no need to take time off with the iMRS or cycle it like 5 days on, two off, etc. 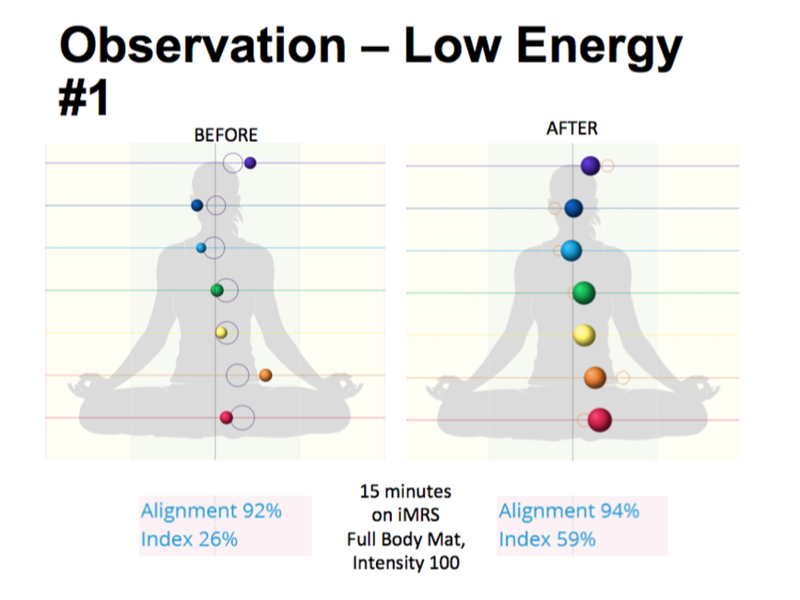 But most significantly, the iMRS advanced Biofeedback system adjusts the intensity in the mat every two minutes to maximize HRV, which gives your body a unique session each time (and graphs this for you to look at after your session)! For those reasons the iMRS 2000 will give you better, safer & more effective long term results over time with no diminishing returns even if you use it every day. 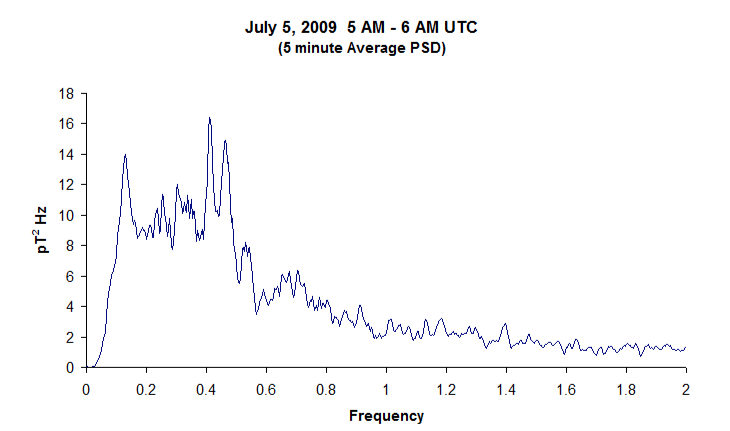 The iMRS minimizes “electro-smog” exposure. The power adapter that plugs into the wall will filter out the unhealthy 60 Hz AC current, and convert it to DC at the wall. Work Directly 1 on 1 with Author Bryant Meyers (Contact me direct or www.iMRS2000.com - only site I work with). 2) Free Energy Medicine Course and Lifetime Membership (www.energymedicine.com). The iMRS has a standard three-year warranty which is extendable to five years. 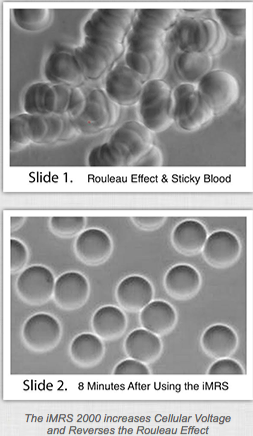 FDA Registered and Health Canada Approved, and Leading Safety Certificates. The iMRS system fulfills all legal requirements in regards to product safety, product usability and is officially certified as a medical device in Europe, USA and Canada! The iMRS has leading safety and quality certificates, including but not limited to ISO 9001, ISO 13485, EEC 93/42 certification, CE/CB product safety certificates, and ISO 14791 risk management, among others. So it’s very well accredited. The iMRS has FDA registration and it’s soon to be one of the few PEMF devices approved by Health Canada. Whole Book based on 10 years of Clinical Data in a Clinical Setting with HUNDREDS of clinical Case Studies. OVER 100 iMRS 2000 Video Testimonials!! Links to MRS 2000 Pub Med Studies... (pdfs below). Low-frequency Pulsed Electromagnetic Field Therapy in Fibromyalgia: A Randomized, Double-blind, Sham-control-led Clinical Study (2009). "To evaluate the clinical effectiveness of low-frequency pulsed electromagnetic field (PEMF) therapy for women with fibromyalgia (FM). [...] The PEMF group showed significant improvements in FIQ, VAS pain, BDI score, and SF-36 scale in all domains at the end of therapy. [...] Low-frequency PEMF therapy might improve function, pain, fatigue, and global status in FM patients." click . IN CONTRAST to the above study with the MRS 2000, this study was done with the Bemer, a competing PEMF device, and showed the Bemer was not effective against fibromyalgia. Pulsed Electromagnetic Field Therapy in the Treatment of Pain and Other Symptoms in Fibromyalgia: A Randomized Controlled Study (2018). "This study demonstrated that [the BEMER PEMF therapy] was not efficient in reducing pain and stiffness or in improving functioning in women with fibromyalgia." click . Other reasons why you may wish to try the iMRS first. Treatment of Whiplash-associated Disorders. Part I: Non-invasive Interventions (2005). "Patients receiving the magnetic field treatment had significantly less pain than the controls (P<0.03) and significantly greater range of motion (P<0.05)." The Effect of Pulsed Electromagnetic Fields in the Treatment of Cervical Osteoarthritis: A Randomized, Double-Blind, Sham-controlled Trial (2006). "Pain levels in the PEMF group decreased significantly after therapy (p<0.001), but no change was observed in the placebo group. The active ROM, paravertebral muscle spasm and neck pain and disability scale (NPDS) scores improved significantly after PEMF therapy (p<0.001) but no change was observed in the sham group." ​Interference of Programmed Electromagnetic Stimulation with Pacemakers and Automatic Implantable Cardioverter Defibrillators (2006). that the MRS 2000 produces MARKED IMPROVEMENTS in circulation. 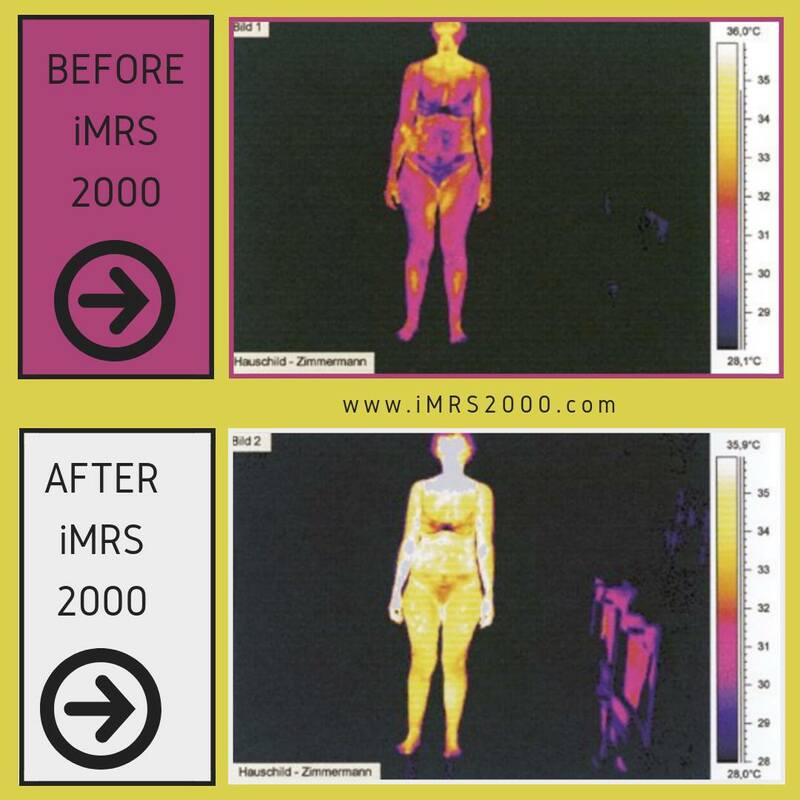 Infrared Thermography Before and Afters with the MRS 2000 show an increase in 3 degrees in surface skin body temperature. This is VERY significant because there is actually NO HEAT in the mat. The results are obtained because the MRS 2000 opens up circulation and microcirculation producing a warmth in the hands and feet (and all over the body). Circulation is one the main KEYS to recovery. The MRS 2000 provides a healthy "trickle charge" as nature intended. In our work with the Kirilian camera, we see more light emmisions from an person after an MRS session than any other modality. What we see is on a par with high level Reiki session. 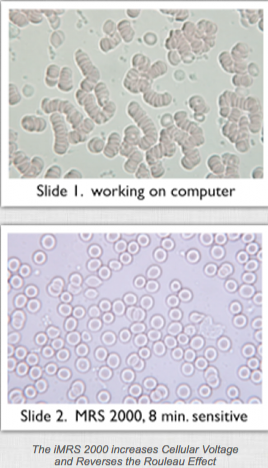 Live blood cell analysis tells the same story. Daily, consistent use brings the greatest benefits. after an eight minute session on the iMRS 2000. WHOLE BOOK of research, case studies and protocols specifically done with the MRS 2000. We give every customer an electronic copy of this book. If you need to see it to make a decision, we can share with you, but not meant for reprint or distribution of any Kind. It was with the older MRS 2000 but again we still use the EXACT same frequencies and waveforms. HUNDREDS of clinical case studies and research with the MRS 2000. AND there are over 300 clinical case studies or testimonials in this book using SPECIFICALLY the MRS 2000. I learned that there are over 250,000 MRS 2000 units in homes in Europe and the former Soviet Union even by the late 1990's and early 2000's. Clinical experience and research have shown the MRS 2000 (now the iMRS 2000 to be helpful for a vast number of health conditions. compendium of information specific to the use of MRS 2000 technology. s. Magnetic field therapy in animals. Very Comprehensive Studies with IMRS 2000. It is important to realize that the iMRS 2000 uses theseTWO of the most proven and MOST RESEARCHED waveforms (sawtooth and squarewave). I am in the process of putting together sawtooth and squarewave research done independently. Trust me IT IS A LOT.. Two best researched waveforms since the 1970's and iMRS uses them BOTH!! Example of research with Sawtooth. from ununited fractures of the tibial diaphysis, showed a healing success rate of 87%.